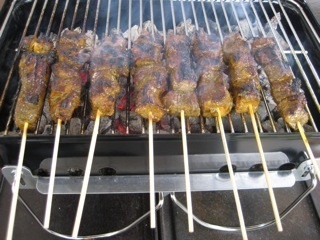 Sates are tiny kebabs from Southeast Asia. 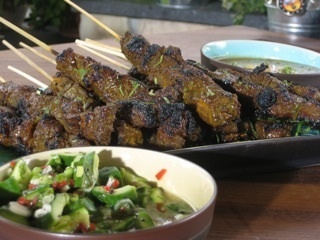 Here’s how we made Singapore Beef Sates last summer on the set of Le Maitre du Grill. Marinate the beef with cumin, coriander, turmeric, and other Southeast Asian spices. 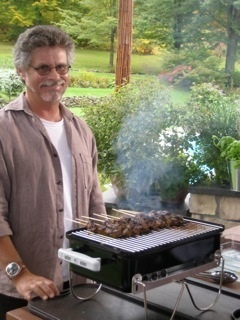 Note how the exposed part of the skewers hang over the edge, so they don’t burn. Sates are traditionally served with a cucumber and chili relish (foreground) and creamy peanut sauce (background).